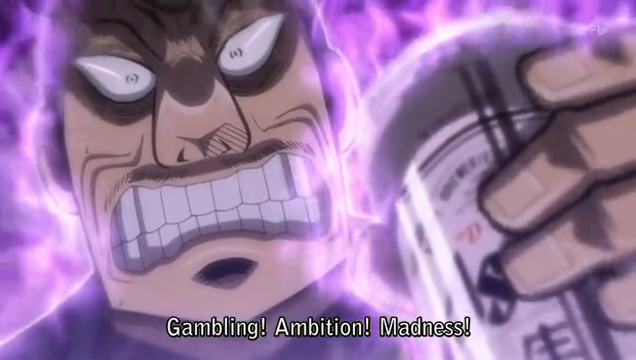 Kaiji season 2 episode 11 – Gambling! Ambition! Madness! Now the only thing a gambler needs is a suitcase and a trunk. And the only time that he's satisfied is when he's on a drunk. 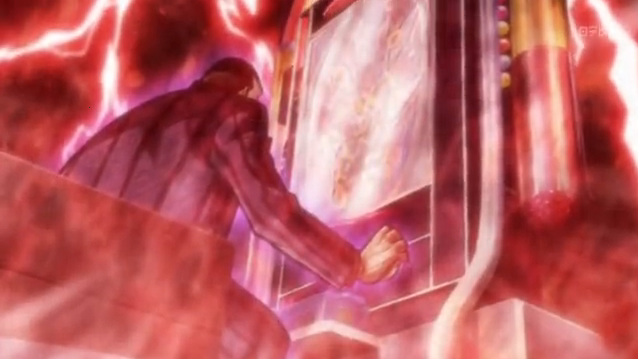 Episode 11 of Kaiji season 2 begins Sakazaki’s battle against the main-eating Bog, a demonic pachinko machine. I enjoyed this episode, first getting anxious while watching the balls drop, then getting hopeful when it turned out that Sakazaki’s plan had some potential, and finally getting angry as everything went to hell, but Sakazaki refused to acknowledge that a change in plans was necessary. Mothers, tell your children not to do what I have done. Don't live your lives in sin and misery, in the House of the Rising Sun. I love the colors on this image, BTW. The limited, red-dominant, palette gives it the look of a religious illustration, depicting the wicked sinner Sakazaki’s descent into hell. Sakazaki’s plan was pretty good, but it is tough to cheat a cheater, and it turns out the house has set Sakazaki up big time. They fed him the info so that he would come in and blow his cash, thinking the machine was on its loosest setting. Things don’t turn out to be that simple, though. The house has some sort of “block” that they can apply, which will prevent him from winning, no matter what. When Kaiji tries to convince Sakazaki to cut his losses, Sakazaki refuses and heads back into the Bog, with no change in strategy. Beyond the tension of the game, and the cheats and counter cheats (and counter-counter cheats) which Kaiji is always good at portraying, this episode was a study in one man’s obsession with winning, to the point that he couldn’t see when he had over-played his hand. As I suspected, Sakazaki was not clever enough to come up with a fool-proof way to beat the house. Now he looks like he will dig his heels in, and lose all his capital, including the money he “borrowed” from work. The risk:reward ratio is rapidly changing against Kaiji. My feeling is that Sakazaki is a sinking stone that he would be better off cutting loose. I can’t help but wonder if any of the information that Sakazaki had was accurate, or if the house had deceived him about everything. His plan was good in theory, but I can’t help but wonder what the block actually is, and how it keeps gamblers from reaching the jackpot – it doesn’t seem like it was used this time, but there have to be scenarios where a win is possible for the house to need it at all. I can see a good deal of the tension in this arc coming from Kaiji learning what the block is so that he can come up with the plan he needs here while Sakazaki is off feeding his boss’s money into The Bog. And I think I love this episode because it gave me the chance to hear the phrase “magnet beer” in an actual conversation. I figure Kaiji is gonna have to pull their asses out of the fire. I don’t know what the “block” is, but it seems pretty formidable, given how tough everything is to get to the point where it comes into play.